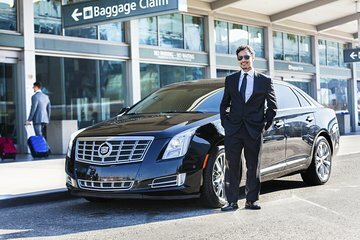 Arranger for en stressfri tur til Los Angeles International Airport (LAX) med denne private transporttjenesten. Møt sjåføren på ditt hotell, og slapp av på reisen til flyplassen i en komfortabel sedan, og du kommer med god tid til flyet. Hopp over stresset med å bestille en taxi eller finne en pendelbuss når Los Angeles-turen din kommer til en slutt. Bare skriv inn dine detaljer når du bestiller, betal på forhånd og så vis kupongen din til sjåføren din. Nyt direkte henting fra hotellet og reise i en romslig sedan for opptil tre passasjerer. Fin touch: rides er tilgjengelig 24 timer i døgnet, syv dager i uken. Prisen er per person, basert på tre passasjerer per kjøretøy. I made it to my hotel lobby at least 5 minutes ahead of schedule, and our driver was already waiting outside. Very good, safe driver. This is the only way to travel. The driver picks you up at your door and drops you at your airline within the airport, beats the shuttles hands down. Worth the extra money. Will not use this service again! After a 14 hour flight and 2 hours clearing customs, our driver arrived late, was not well presented and had my name written on a crumpled piece of paper, the other drivers at the airport were in suits and holding tablets with names on them he grabbed our bags and took off at pace through the congested airport with us trying to keep up. Car was old and no bottles of water were provided. He took us a long way around using back streets. We did not feel safe at all! Once we arrived at the hotel I have him a 5 tip which I did not think he deserved but he then told me I actually owed him another 15 for new airport taxes, I tried to argue and said there was nothing on the voucher about that and he said no they are new.. I was tired so in the end gave him the extra money. When booking the return transfer I asked the company about the extra money and they knew nothing about any extra taxes.. which is what we had been told by everyone else we asked, so I requested not to have the same driver again as he had basically stolen from us! Unfortunately 5AM the next morning when our return transfer arrived it was the same man, we told him we had complained about him and we would not be getting in his car. He became extremely agitated and aggressive, waved a fist in my face and tried to put my bags in his car insisting we still go with him.. we did not and got in a taxi. Awful to start our Holiday, and waste of money.